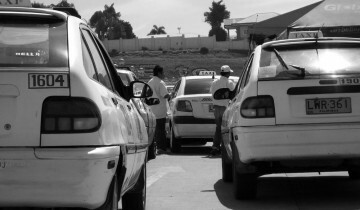 The Land Transportation Franchising and Regulatory Board (LTFRB) ordered the drop of the flagdown rate for taxis nationwide from P40 to P30 starting Monday. Commuters welcome the move but taxi operators plan to go to court to stop the rollback. Lawyer Jiecel Tiu, according to her spokesperson lawyer Rex Fernandez, is amenable to enter into a compromise agreement but would like to set the conditions. One of the things she’s asking for is a written public apology from the vice mayor, his wife, and two other family members. The Land Transportation Franchising and Regulatory Board (LTFRB) ordered a P10 cut in the flagdown rate for taxis nationwide. Creative Commons photo by Andrionni Ribo. The bidding process and securing approval from the Cebu City Council for road rehabilitation projects is causing the delay of road repairs. While the flagdown rate for taxis will be reduced by P10 from P40 to P30, the rate of P3.50 for each succeeding 300 meters of travel remains. The yellow taxis that serve the Mactan-Cebu International Airport are also included, with flagdown rate from P70 to P60. The provisional rollback is due to lower fuel rates. Pump prices of premium gasoline and diesel have dropped more than P10 per liter between September 2014 and March 4, 2015. The rollback is a welcome move for the commuters but some taxi operators in Cebu are planning to go to court to stop the rollback. The last time the flagdown was P30 was in December 2010. Tiu’s camp turned down the offer Vice Mayor Jonnah John Ungab presented when he visited Tiu’s residence in Minglanilla, Cebu Thursday night, calling it a ridiculous and stupid offer. Fernandez denied that Tiu asked for P500,000 from Ungab to settle the case. Tiu wants to set the conditions to the settlement, first of which is that Ungab, his wife Pearl and two of the vice mayor’s family members issue a written public apology to Tiu. Pearl Ungab allegedly rammed Tiu’s car and attacked Tiu with a baseball bat last Feb. 26 over suspicions of an extra-marital affair between her husband and the lawyer. Cebu City may not be able to finish the road rehabilitation projects in time for the Asia-Pacific Economic Cooperation (APEC) whose meetings would start in August this year. According to City Department of Engineering and Public Works Chief Jose Marie Poblete, accomplishing all the required documents may take two to three months. Also, since the appropriation for road projects are in lump sum, the budget per project need to be forwarded to the council for approval. If there is no problem in the road right of way, road projects would usually take at least three months to finish in the urban areas. Meanwhile, another traffic experiment will be implemented along Escario Street in Cebu City, with the inclusion of the internal road of the Capitol grounds for vehicular access, to address the traffic congestion in the Capitol area. In the North Reclamation area, Mandaue City Traffic Manager Edwin Ermac said he would seek another coordination meeting next week to restore the two-way access in Ouano Avenue, to ease the severe traffic congestion in Mandaue City after the closure of S. Osmeña Road for rehabilitation work.